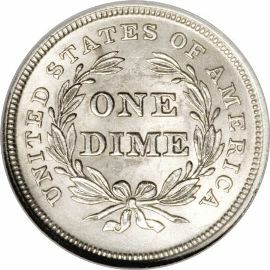 The Seated Liberty Dime (no Star Variety) was produced at the US Mint from 1837 to 1838. A rough drawing of these coins was originally sketched by William Kneass, who later suffered a stroke and was unable to complete his work. Artists, Thomas Sully and Titan Peale were later hired to complete the sketches. Mint Director Robert Maskell Patterson offered Christian Gobrecht a permanent position behind the aging Kneass as assistant engraver. Gobrecht completed the dies based on Sully's drawings. 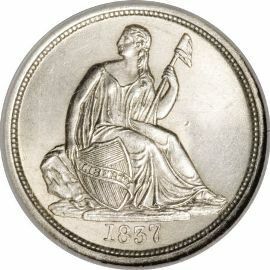 seated on a rock holding a shield in her right hand and a staff in her left topped with a Liberty Cap. The shield has a scroll on it with "LIBERTY" inscribed on it. The design is based on the English Britannia, which had been long admired by Mint Director Patterson. As the name implies, these silver coins lack stars representing the original thirteen colonies. This fact was not taken lightly and they were later added in 1838.